Out here on Vancouver Island, the first few days of spring have been largely grey, with intermittent periods of dismal. I mention this not to complain (we had a wonderfully warm and sunny run in the late winter) nor because these conditions are unusual (spring rarely arrives with a clichéd fanfare), but as a matter of contrast. Despite the grizzled pallor of the change of season, there are bright flashes of colour: the reds and purples of tulips, the shocking green of a city park lawn, the pink of cherry blossoms. There are signs on the sides of city buses, seeking daffodil pickers. It may not feel like it quite yet, but trust me, it’s here. You can tell from the parka clad crowds on Toronto patios, and the look of guarded optimism as the last winter storm strikes the east coast (please, the expressions seem to say, let this be the last one). You can taste the change in the air. Canada’s dedicated independent booksellers are feeling it too. This is a season of renewal, of new projects, and, of course, of new books. Here are a few of their current favourites, some of them on the shelves already, and a couple to look forward to in the next few weeks, like buds set to burst into beauty. This is a "read until 3 a.m." book. It's a story of high adventure, daring travel and scary situations, told with asides of contemplative wisdom. My husband and I both loved it. When Sarah Selecky's first book, This Cake is for the Party, dropped about seven years back, it was a clear sign of a singular talent. Her short stories were literary to be sure, but they had a sensibility and propulsion that were easy to marvel over. With her forthcoming novel, Radiant Shimmering Light, Selecky is ready for a star turn in Canadian fiction. Lilian and Florence are cousins for whom a family argument turned into twenty years of silence. Lilian is the shy Canadian cousin, a commercial artist who has watched from afar as Florence, the American cousin, rockets to fame with a glossy web-based female empowerment lifestyle brand. When Florence, now Eleven Novak, reaches out to Lilian and offers her a plum job overseeing the Ascendancy brand, her life changes, her consciousness raises and her bank account swells. Surely this ride will come to an end, but living with intention has never felt so genuine. Has it? Radiant Shimmering Light is timely, easy to dive into, and has “summer read” all over it. But this is also a literary work that drills deep into character; it’s about as good as it gets for a discerning reader. If there's some gas in the tank, so much the better. This Cake is for the Party was shortlisted for the Giller so watch this one: if there's any justice, Radiant Shimmering Light is going to be everywhere on the fall awards lists. Based on the synopsis, you might enter this book thinking that Kim Fu will take you on a journey of clear-cut trauma and its long-lasting effects. The reality, however, is not so simple. Reading this book you will rarely find a dot-to-dot moment, as life is rarely so simple and trauma is not always the forefront of causality. Sometimes trauma is so hidden even we as the reader may not be able to clearly see it. While we may not be able to clearly understand or relate to how the trauma continues to affect these girls, there is absolutely no doubt that it does in uniquely individual ways. The tragic current of this book and the frustration of not being able to help, to fully understand these five girls, made me care for them more. I wanted to shout at them and shake them and hug them for so many reasons. This book, especially a particular sequence of chapters, unexpectedly broke my heart. Take the synopsis with a heaping grain of salt. It took me a few days to accept that it didn't give me what I was expecting from the story, but that the subversion of those expectations did not detract from the quality of this book at all. This is the fourth novel in this clever mystery series. Lane Winslow, an ex-wartime spy, has settled into King’s Cove and gets involved in yet another suspicious death, while her friend Inspector Darling is dragged into an event from his time in WWII that puts him in serious trouble with the law. The characters in this series are well-drawn and the moving back and forth between the past—including Lane’s reasons for choosing to live in a small quiet village in B.C.—and the current drama in her chosen new life are well handled. I have read all four of these novels and am hoping that Iona has lots more to come! If you are a fan of British mysteries, as I am, you will love this series. And these are based in B.C.! Bonus! With spring upon us it is time to start planning what we want to plant. And what better time to experiment with growing your own grains? Dan Jason & Michele Genest’s Awesome Ancient Grains & Seeds is a "Garden to Kitchen Guide" of how to grow your own grains and what to do with them come harvest time. The first third of the book is devoted to teaching you what to grow and how to grow it, followed by 50 mouth-watering recipes to enjoy. 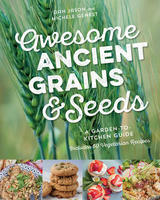 Awesome Ancient Grains & Seeds is a near-perfect crossover for gardeners and cooks, and will be equally loved by the armchair variety.